Yoakum Community Hospital will observe National Doctor’s Day on March 30, 2019. Eudora Brown Almond, the wife of Georgia physician Dr. Charles B. Almond, established this special day in 1933 to honor physicians for their selfless and unwavering devotion to healing and for their significant contributions to patients and to society. That date in 1842 marks the first time ether was administered as a surgical anesthetic in the United States, by Dr. Crawford Long. 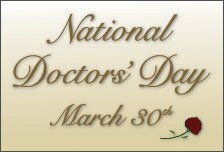 In 1991, President George Bush officially proclaimed March 30th National Doctor’s Day. Often medicine’s unsung heroes, the medical staff physicians at Yoakum Community Hospital strive daily to provide the people of our local community with compassionate and effective routine and emergency care. In honor of Doctors’ Day, Yoakum Community Hospital held their 8th Annual YCH Choice Award – Physician of the Year. Staff, patients and their family members were encouraged to fill out a nomination form located at the Med/Surg station. The 2019 Physician of the Year will be announced on Thursday, March 28th at an appreciation breakfast hosted for our local physicians.